Online Videos are getting bigger and better. According to a recent report released by ComScore, US viewers watched an average of 3 hours of online videos in July. It is estimated to grow at even faster rate in coming years. Although, India is far behind in online video consumption due to extremely low broadband penetration, but as with everything, it is changing. Telecom department in India is aggressively pushing the broadband in Indian households. 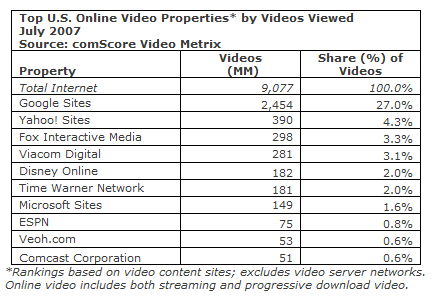 Here is a quick look at ComScore figures. Although, I have my reservations on growth of paid video sites, I have no doubt that socially driven free videos like Youtube, Veoh and Metacafe are going to take the lions share of our time on Internet in coming years. Imagine this, you are in a new place and want to visit a restaurant, you go on the internet and check out the video of that restaurant to see the ambience, setting, seating arrangements etc. You are traveling out of country and living in an unknown city and hotel. You go on the net and check out the videos of various places in that unknown city and see the video of hotel and rooms you will be staying to ensure that it is upto your expectation. This concept has been quite old, however, it is starting to get feasible only in recent times. Companies like Geobeats and Trivop have travel, city and hotel video guides. It is literally like you visit the place before you make the decision to actually move there. This same concept can be applied to real estate buying, Candidates video resumes and hundreds of such other areas. Some skeptics may say that videos may hide negatives and show only positives. This may defeat the whole purpose. However, in this age of blogging and social journalism nothing remains hidden. Blogging is even bigger than online videos. Total number of online blogs are close to 100 million. That number is bigger that even the total number of websites on the internet. I have mentioned this several times earlier on my blog, but in future, Blogging will be as important as email is today to us. Blogging and Online videos together form a lethal informative force.